The pictures released by National Aeronautics and Space Administration (NASA) revealed much new information about the largest planet in our solar system, namely Jupiter. Taken by the Hubble telescope, the photographs showed a rare wave in the northern part of the planet's equator. NASA said it also discovered a kind of very thin fibers in the core part of the famous Great Red Spot on the planet. Great Red Spot is a storm that is thought to have been rotating in Jupiter's atmosphere for more than 400 years. 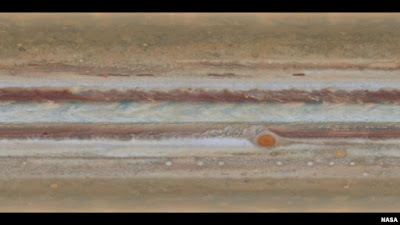 "Every time we observe Jupiter, we always felt there was something exciting is happening there," said Amy Simon, a planetary researcher at NASA's Goddard Space Flight Center in Greenbelt, Maryland, in a statement. One other images, which were made with the Wide Field Camera 3 on the Hubble telescope, showing successive rotation giant planet so scientists can measure the wind speed there. New photos also revealed that the Great Red Spot on Jupiter were dwindling and increasingly round. The pivot point of the red giant is now 240 kilometers shorter than last year, said NASA. That point is now leaning more orange than red. For the first time, researchers saw a kind of thin fibers are spun in that point. According to the photos, the fiber was formed by wind speed above 150 meters per second.